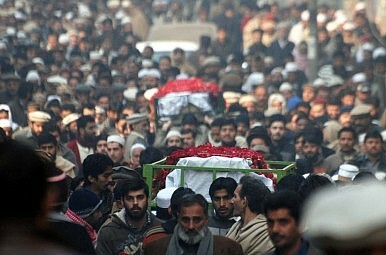 Has the barbarity of December 16 finally changed the way Pakistan’s politicians view security? In the same breath with which we applaud Malala Yusufzai for her Nobel Peace Prize, we mourn and grieve the loss of at least another 148 students and teachers, most of them children, working to fulfill her vision. Such is the enigma of Pakistan. At a press conference marking the completion of the operation against the terrorists in the Army Public School in Peshawar, Inter-Services Public Relations Director General Asim Bajwa said this was the “Blackest Day” in Pakistan’s history. Each year in Pakistan dates on the calendar are darkened, some a shade darker than others. None quite as dark as December 16: The Express Tribune the morning after led with the headline “Our Darkest Hour,” TV-stations blackened their logos, and in a show of solidarity people on social media changed their display pictures to a black screen. After a period of introspection and mourning, Pakistan will have to answer a tough question: Where does it go from here? The logic guiding the Taliban’s attack on the Army school was twofold: to inflict the same pain on the children of the Armymen that the families of the militants felt and to signal to the Army that despite a reduction in attacks and civilian casualties, the terrorist network is still alive and well. In the short term, what is certain is the resolve of the Army (and now perhaps the country) in continuing the operation in Waziristan. The day following the attack, Sharif removed the six-year moratorium that had been set on the death penalty in cases involving terrorism. Interior Minister Chaudhry Nisar Ali Khan followed this decision by announcing plans to execute 500 convicted terrorists whose appeal had been denied. While strict accountability and oversight over this procedure will now be required, it did send a tough signal to the Pakistani Taliban and other militant outfits. Moreover, the Army has already launched retaliatory strikes, leading to the deaths of dozens of militants. Chief of Army Staff General Raheel Sharif, who during his recent trip to Washington won praise from the Obama administration, also made a trip to Kabul on Wednesday to discuss intelligence sharing with Afghanistan’s President Ashraf Ghani. Soon thereafter, Afghanistan and Pakistan launched coordinated operations in the eastern Kunar province, where TTP leader Mullah Fazlullah is said to be hiding. These cooperative actions will help reduce uncertainty over each other’s intentions, a problem that has plagued Af-Pak relations for the greater part of the last decade. As to whether or not a serious and significant ideological shift within the Army on dealing with terrorists has taken place – the jury is still out. Some, such as Peter Bergen of the New America Foundation, believe that there has been a “sea change” in how the Pakistani Army views the Taliban, no longer giving the group the room to grow and spread. Others are less sanguine, and contend that the Army will continue its fight through proxies in Afghanistan, India, and Kashmir. The reality lies somewhere in between. The operation against the militants launched six-months ago shows a serious commitment from Pakistan’s Army and the civilian leadership towards severing ties with the Pakistani Taliban. However, the government and the Army have not done enough to suggest that all militant outfits will be painted with the same brush. Hafiz Saeed’s Lashkar-e-Taiba (LeT), for example, continues to operate freely and is said to be close to the powerful intelligence service. At the conclusion of funeral prayers, Saeed, granting benediction to the Pakistani Taliban, placed blame on forces within India and threatened the country for its “conspiracy” to destabilize Pakistan. Against a backdrop of growing calls of ending support to militants, and protest from federal prosecutors, the Anti-Terrorism Court granted bail to LeT commander Zakiur Lakhvi, alleged to be the mastermind of the Mumbai terror attacks. Moving forward, the fallout from the attack may help move Taliban apologists to the margins of political dialogue, though more work will be needed on the part of the civil society actors such as the media. What’s unfortunate is that it will have taken years of failed negotiations, thousands of innocent lives, and finally, the barbarity that transpired on December 16, to register some change in how politicians view security policy. Hamza Mannan is a freelance writer, whose work has appeared in Asia Times Online, Express Tribune, and The International News.